Wholesome treats that are packed with flavor and protein are the kind of treats dogs and cats can rally behind. 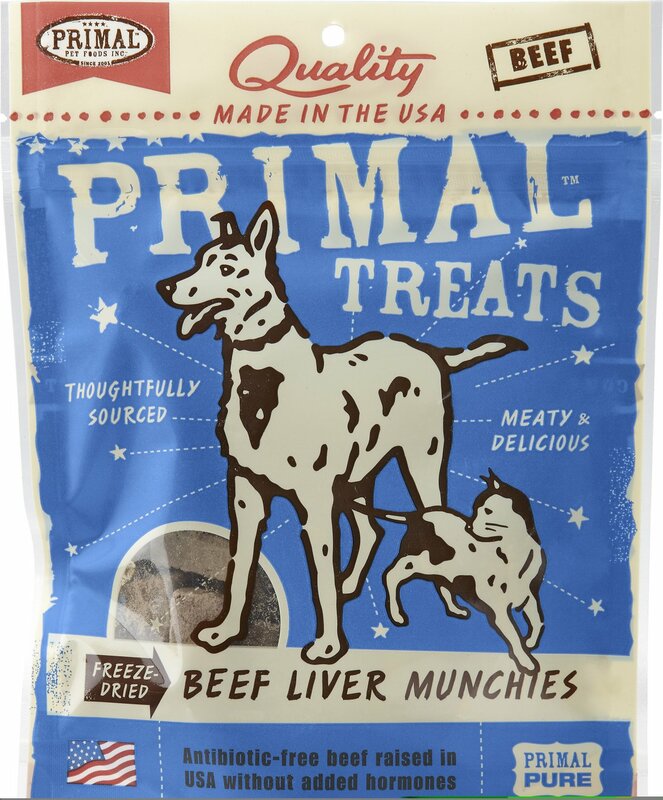 Primal Beef Liver Munchies Raw Freeze-dried Dog & Cat Treats are produced using beef raised in the United States without antibiotics or added hormones, and contain no preservatives, grain or gluten. These treats get their concentrated meaty flavor and high-density nourishment from the low-temperature freeze-drying technique. As a single source protein, Beef Liver Munchies offer a healthy snack for cats and a nutritious training and obedience reward for dogs. Wholesome treats for both dogs and cats are crunchy and have an irresistible flavor. As a single source protein, Beef Liver Munchies offer a healthy snack for cats and a nutritious training and obedience reward for dogs. Made with a single source protein and without preservatives, added salt, or added sugar, they are the kind of snack dogs and cats can rally behind. Produced using beef raised in the United States for a high protein and healthy delicacy. Treats get their concentrated meaty flavor and high-density nourishment from the low-temperature freeze-drying technique. Feeding: We recommend feeding our Beef Liver Munchies as a wholesome snack or training treat to dogs or cats. Always monitor your pet when feeding. Storage: For optimum freshness after opening, store in a cool, dry place. Be sure to seal bag completely after feeding. With Primal treats, you can give your pet a healthy snack that doesn't compromise on flavor. Low-temperature, slow cooking techniques like freeze-drying and slow roasting lock in natural nutrition and taste, for the best of both worlds. Each treat recipe is made with a single source of protein, so they are a great choice for all pets, even those with allergies. Primal knows that snacking should be simple. That's why they stick to a compact list of ingredients that never includes any grains, gluten, corn, wheat and soy. With Primal, your pal gets the flavor he craves without any unnecessary ingredients or fillers. Even animals with discerning palates can enjoy every bite. Primal freeze-dried recipes are made in the USA and packed with ingredients from around the globe—including the USA, New Zealand, France and Spain. Best of all, each of those delectable ingredients is responsibly sourced. You'll find certified organic fruits, vegetables and supplements, and protein sources that are ethically raised, too. Because every step counts when it leads to your pet's bowl. With a variety of dog-approved textures, these treats are as versatile as they are flavorful. Rip them, shred them or toss them whole—as a snack or training treat. Primal's assortment of treats are the perfect reward for any occasion and pets of all sizes. Whether your best friend enjoys crispy Snaps, moist Chips or crunchy Shredders, you're sure to find the treat to please your pup's palate. My cat didn’t like this at all. Then again she is a picky eater. I thought for sure she would like this since it’s only beef liver, no other ingredient. But she wouldn’t go near it. If you cat is picky, just something to consider this might not be a good option for her/him. I recommend freeze dried beef liver as it adds taurine to the diet much needed for cats especially if on a grain free diet. However, these treats are block sized and must be broken up for a cat. Because they are too large, I won't be buying them again even though they seem to be excellent quality. That is why I didn't give it 5 stars. Perhaps there should not be a picture of a cat on the package. She loved these so much she uncharacteristically hunted them down. She managed to get them down from where they were stored and ate the whole bag!! Of course I was concerned she may have had some "issues" due to the over indulgence, but we provided tons of water and she showed no reaction. If we order again they will have to go inside a container. Would definitely recommend. My Theo LOVED these, but the last two orders seemed BURNED! I know freeze dried isn't cooked, but the bits were literally black, and my dog would not eat 2/3 of each bag (because 2/3 of each bag, at least, were BLACK). I am hoping the next order is back to the original or I will have to find another treat for my baby boy. I don't recommend this item anymore...not until I get a good batch again. My fur babies just love the primal treats. They are quality treats, which is very important when feeding the fur babies. These treats are very dry. Our dog takes some medicinal oil, which I drizzle over the treat. The oil soaks in very well, and our dog gobbles it up. I don't love the smell, but she does. I have two yorkies! These treats are soft and can be broken into smaller pieces! My boys love them! My Bubby is 6 years old and my Brady is 10 months! I order 3 bags each month! Yes! They are spoiled! My fur babies love these as treats, topping for food, and any other way they can get some! If I pick up the bag, I have two VERY attentive dogs!! My dog and 2 cats think this treat is awesome!! It's good to have 1 treat for all 3. The freeze dried liver is good for them too!! Bought for the cats but the dogs love them too. I am glad because can’t find anything for the cats that doesn’t have chicken in it.